America’s infrastructure is a vast network of roads, bridges, tunnels and railroads that keeps the economy moving. From the power grid to water systems and airports to schools, infrastructure is essential to our daily existence. It’s what keeps the lights on, transit running and the country open for business – day in and day out. The rapid pace of technological innovation has infiltrated our built environment, which has increasingly become more connected to high-speed internet as we hurdle head on into a data-centric and even autonomous future. And yet issues of maintenance and repair continue to chip away at the country’s future. Where will investments come from to make these critical systems durable for long-term sustainability? Will there be bipartisan consensus to a federal overhaul, or will private sector pave the way? 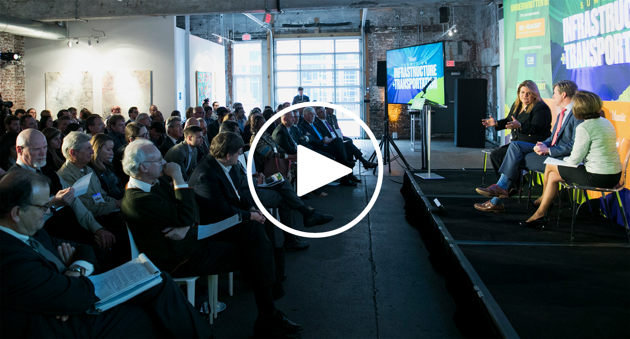 The Atlantic gathered policy makers, business leaders, innovators and experts to explore the future of our nation’s infrastructure and transportation systems. America’s infrastructure is a vast network of roads, bridges, tunnels, railroads and pipes and power lines that keeps the economy moving. The Atlantic gathered policymakers, experts and innovators to lay out the issues and the way forward to bring America’s infrastructure and transportation systems into the 21st century. *This speaker participated in a session that is produced by our underwriter BASF, and not by The Atlantic's editorial team. **This speaker participated in a session that is produced by our underwriter GM, and not by The Atlantic's editorial team.